Z2C #9: 10 Most Important Thin..
Notice their tagline is not “for people who love to cook.” A great resource for inspirational dishes, Epicurious is not the best bet for every day cooking. Think about where their recipes come from – does your dinner table look like a spread in from Gourmet or Bon Appetit every night? I know mine doesn’t. Well, some nights it does, but nobody cooks like that all the time. Now let’s take a look at the ways that Epicurious isn’t so useful. As I highlighted yesterday, recipes from Epicurious are basically a guarantee for gourmet glory in the kitchen. 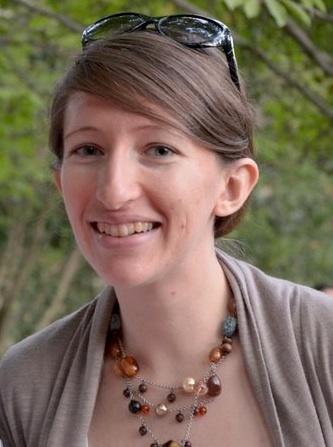 But these recipe editors are no snake oil salesmen – the dishes are fantastic because you have to work for them. Contrary to the idea that simplicity is the best policy, here, perfection is achieved by adding more ingredients. 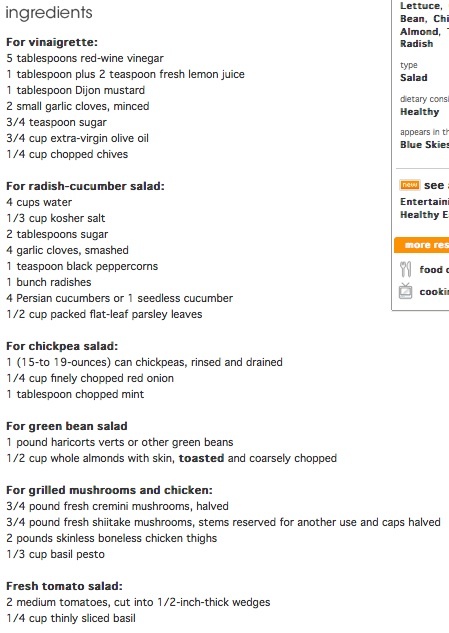 I actually couldn’t fit all of the ingredients on one screen – there are a couple more further down. I don’t even see the fruit in there! Did I mention that the chicken salad above takes at least an hour and a half of active time to make? Oh, and get a load of the cooking time on this dessert I found in the “dinner rush” section that is explicitly made for super quick recipes. Getting back to salad. In my mind, salad is a five minute thing. But again, on Epicurious, they are going for heavenly gourmet food perfection. So, of course, it is totally rational for a salad to take 35 minutes of active time. 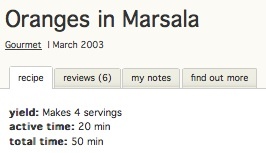 Do you think they spend that much time to make a single salad in a restaurant?! The Search Function Makes You Search . . .
. . . through the results . . a lot. In my book, this is the single most annoying part of the site. 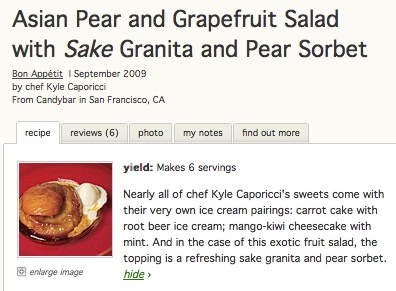 As I mentioned yesterday, Epicurious is a very useful place to find obscure dishes. However, it is far easier to find rare dishes than simple roast vegetables. There are simply so many recipes on the site, many of which seem to be very slight variations on one another, that it can often be difficult to find simple things. Even though I didn’t enter “salad” as a search term, four out of the first six returns are all for some type of beet salad. It isn’t until return #6 that I come up with something that looks like it could potentially be simple roast beets. Granted, I could probably sift through the “Halibut with Roasted Beets, Beets Greens and Dill-Orange Gremolata,” recipe and figure out how to roast beets. 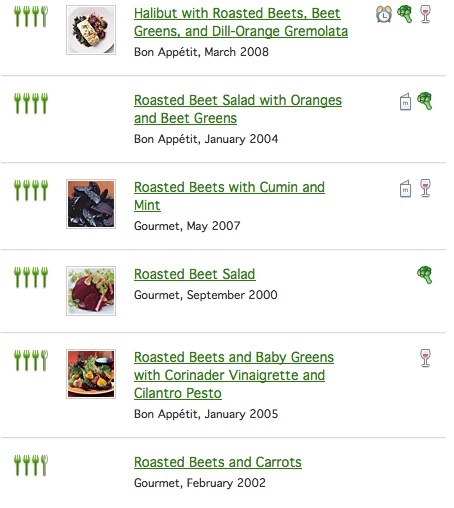 But when there are other recipes specifically for roast beets, why do they have to display all of these not-so-relevant returns first? Do I want the “basic” recipe from a fifty year old issue of House & Garden? 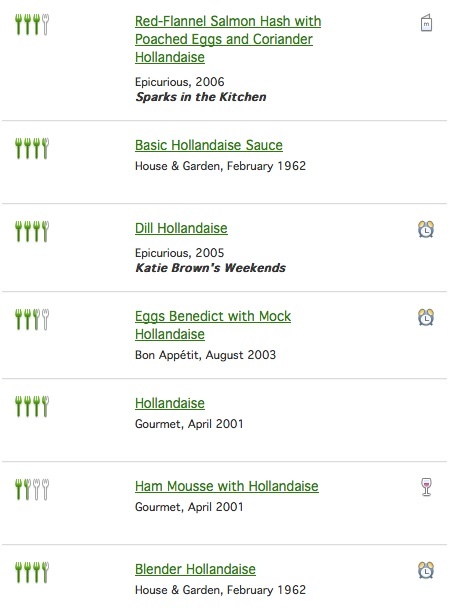 Blender hollandaise sounds like it would save me the potential failure of normal hollandaise, but it is equally old. Maybe the one that is simple called “Hollandaise” from Gourmet? Who knows. Epicurious is a great resource and I use it often, but it has some major drawbacks for home cooks who are short on time, patience, or exotic ingredients. As the tagline says, this site is for “people who love to eat.” It is more for the epicures than the cooking curious.